Gillie A. Dodd was the second child born to Theophilus Dodd (1806 - 1877) and Rebecca O'Neil (1802 - 1884). 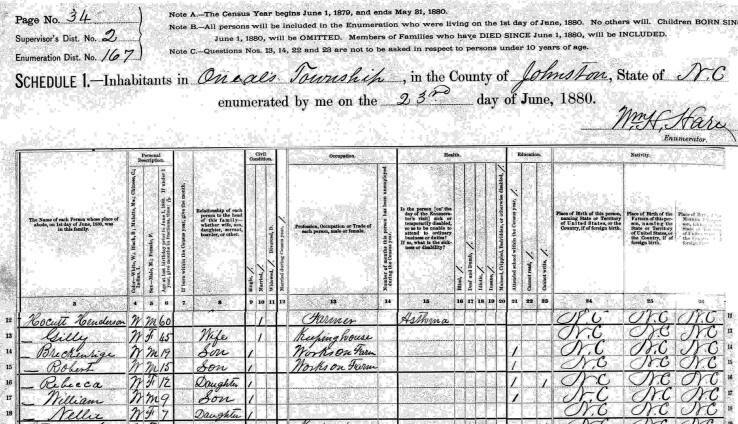 The 1850 Census shows Theophilus and Rebecca living in the Dunn District of Franklin County, NC. Theophilus was 44 years old and Rebecca was 46. The Census shows 8 children living with the family: Fereby/Phereby (age 16), Gilla/Gillie (age 14), Henry (age 13), Thomas (age 11), Caroline (age 9), Elizabeth (age 8), Ransom (age 6) and Rebecca (age 5). Gillie married Henderson Hocutt on 21 Jun 1859 in Franklin County, NC. Henderson was born in 1821 and was the son of William Brown Hocutt and Lucretia O'Neil. 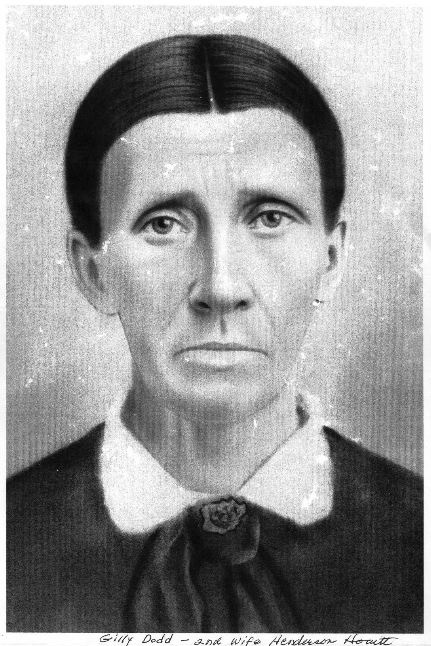 Henderson was a widower who had been married to Rebecca Tisdale (08 Sep 1839 in Nash County, NC). Rebecca had died in 1856. Henderson had at least 8 children from his previous marriage to Rebecca Tisdale. Page 22 of the 1860 Nash County, NC, Census shows Henderson and Gillie living in the Sullivants District. The Census was enumerated on 15 Jun 1860. The Census shows the difference in Henderson and Gillie's ages (about 15 - 18 years). His occupation is listed as "Farmer" and he had accumulated a very nice estate. The value of his Real Estate was $3000 and his Personal Estate (crops, livestock, house, furniture, etc) was valued at $7655. The Census show Gillie to be only two years older than Henderson's eldest son, Elisha. The children living on the farm were Elisha (age 18), Stephen (age 17), Sallie (age 14), Zechariah (age 13), Samuel (age 11), Polly (age 9), Thomas (age 6) and Lou Ella (age 4). Gillie was pregnant at the time of the 1860 Census, but her first child with Henderson (John Calvin Breckenrige Hocutt) wasn't born till 25 Jul 1860 - a month an 10 days after the 1860 Census was enumerated. Henderson and Gillie Hocutt had at least seven children. Some major things seem to have happened to Henderson and Gillie between 1860 and 1870. To begin with, he lost 2 sons in the Civil War. The family had a Real Estate and Personal Estate value in 1860 of over $10,000 (which was a LOT for that time), but by 1870 it was $2500. Elisha Ruffin Hocutt: On 15 May 1861, at the age of 20, Elisha Ruffin Hocutt enlisted in the Confederate Army in Johnston County, NC. He enlisted as a Private in Company C, 24th Infantry Regiment North Carolina. He was killed on 19 Apr 1864 at Plymouth, NC. Stephen H. Hocutt: On 22 Sep 1862, at the age of 20, Stephen H. Hocutt enlisted in the Confederat Army in Winchester, VA. He enlisted as a Private in Company C, 24th Infantry Regiment North Carolina. He was killed Jun 1864 at Petersburg, Dinwiddie, VA.
Stephen married Elizabeth Bailey on 11 Jul 1860 two years before enlisting. 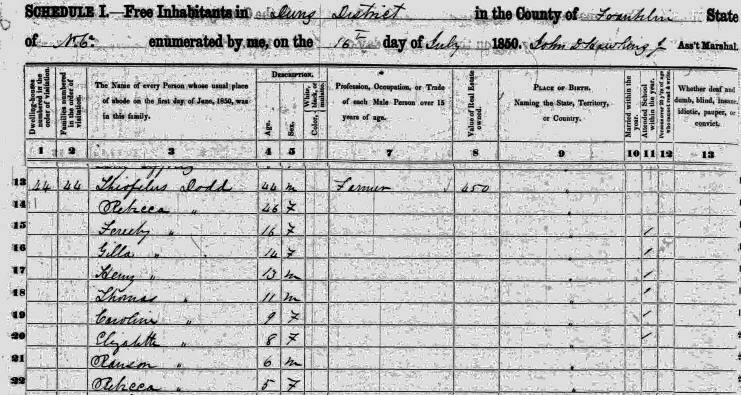 The 1870 Census finds Henderson & Gillie Hocutt and 8 of his children living with his son Zachariah Urias Hocut and his family in the Springfield Township of Nash County, NC. 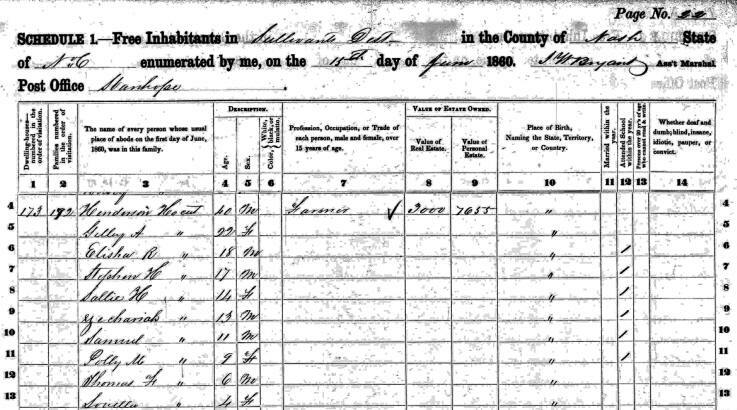 Zach had married Jane E. Hollimon (transcribes on the Census originally as "James") on 21 Mar 1869 in Johnston County, NC, and the Census shows them with a daughter Sarah E. (age 6 months). I had seen this Census previously and had decided it wasn't Henderson. His age is listed incorrectly and someone transcribed the name below his as "Suelly" instead of Gillie. Henderson and Gillie have 8 of his/their children living with them. The children listed on p. 45 of the Nash County Census were: [Children by Henderson Hocutt and Rebecca Tisdale] Samuel (age 22), Polly (age 19 - even though on the Census it looks like "40"), Thomas (age 16 - listed on the Census as 18) and Lou Ella (name written as "Louoler" on the Census, age 15). [Children by Henderson Hocutt and Gillie Dodd] J. C. R. (actually John Calvin Breckenrige - age 10), Creacy Jane (age 8), Robert E. Lee (age 5) and Rebecca (age 3). Even though Zach is listed first on the Census, indicating that he is the head of the family, the only Real Estate Value is assigned only to Henderson (although it has been listed beside of Gillie's name). Henderson and Gillie's Real Estate Value is $1300 and their Personal Estate is valued at $1200. This is a major difference from their 1860 Estate Value in Nash County, NC, of over $10,000. Even though Henderson is listed as a "Farmer" on the 1860 and 1870 Census, he accepted the "call" and eventually became a preacher. He was the founder of the Antioch Baptist Church near Emit, North Carolina and also organized Cornith Baptist Church (of which he was a pastor). He was also a member of the White Stone Masonic Lodge. 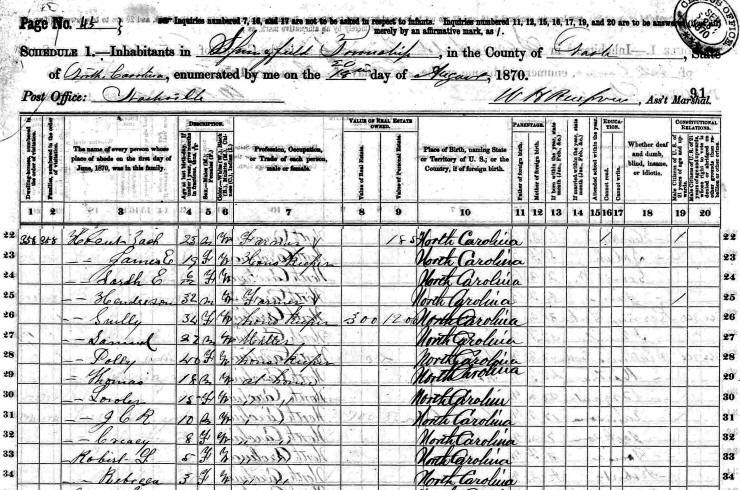 The 1880 Johnston County, NC, Census shows the Henderson family living in O'Neals Township. Hender's age is listed as 60 and Gillie is 45. Children still living with the family are Brechenridge, Robert, Rebecca, William and Nellie. Reecca's age was 12. The Census shows that all the children attended school (except Nellie) during the year, but for some reason Rebecca couldn't write (even though she could read). The Census also shows that Henderson suffered from Asthma. Rev. Henderson Hocutt died 17 Oct 1880 in Johnston County, NC, at the age of 59. Gillie Dodd Hocutt died 12 Mar 1885. If you have additional information about Gillie Dodd Hocutt, please contact me.